1. Science Daily, 7 March 2007, http://www.sciencedaily.com/releases/2007/03/070305140830.htm, accessed June 12, 2007. 3. Malmsheimer, Robert W. et al. , “Forest Management Solutions for Mitigating Climate Change in the United States,” Journal of Forestry (April–May 2008): 129–31. 4. Neustadt, Richard E. and May, Ernest R., Thinking in Time: The Uses of History for Decision-Makers (New York, 1986), xv. 5. 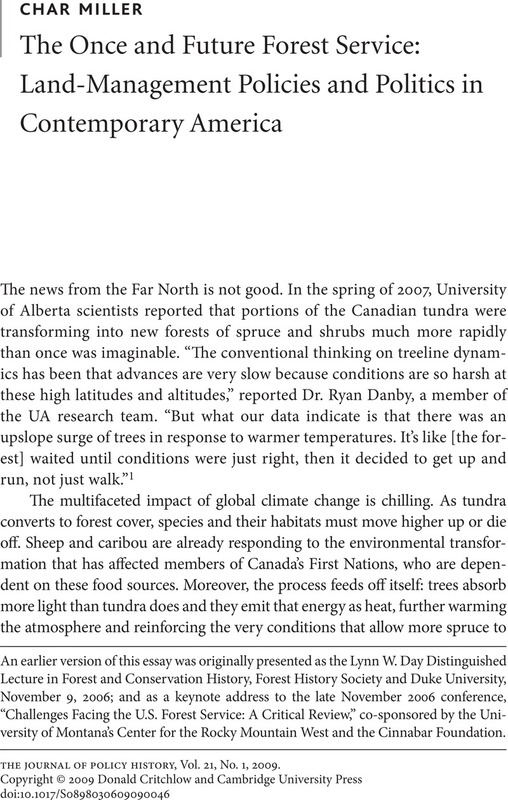 Thompson, Tom, “Forestry and Climate Change,” Journal of Forestry (April–May 2008): 113. 6. Marsh, George Perkins, Man and Nature: Earth as Modified by Human Action (New York, 1864); Pinchot, Gifford, The Fight for Consevration (New York, 1910). 7. Ibid. ; Steen, Harold K., The U.S. Forest Service: A History (Seattle, 1976); Reiger, John, American Sportsman and the Origins of Conservation, 4th ed. (Corvallis, Ore., 2001). 8. Miller, Char, “Crisis Management: Challenge and Controversy in Forest Service History,” Rangelands, June 2005, 14–18. 9. Nie, Martin, “The Bitterroot Controversy,” http://forestryencyclopedia.jot.com/WikiHome/Bitterroot%20Controversy, accessed 12 June 2007. 10. Thomas, Jack Ward, “What Now? From a Former Forest Service Chief,” in A Vision for the Forest Service: Goals for Its Next Century, ed. Sedjo, Roger (Washington, D.C., 2000), 10–43; Miller, Char, “Identity Crisis,” Forest Magazine, Winter 2008, 44–47. 11. Dombeck, Michael P., Wood, Christopher A., and Williams, Jack E., From Conquest to Conservation: Our Public Lands Legacy (Washington, D.C., 2003). 12. Graf, William L., Wilderness Preservation and the Sagebrush Rebellions (Savage, Md., 1990); Miller, Char, Gifford Pinchot and the Making of Modern Environmentalism (Washington, D.C., 2001), 163–67. 13. Druska, Ken and Burt, Bob, “The Canadian Forest Service: Catalyst for the Forest Sector,” Forest History Today, Spring–Fall 2001, 28. 14. For differing opinions about the meaning of this transformation, see McEwen, Andrew D., “Exit of State from Plantation Forest Ownership in New Zealand,” http://www.maf.govt.nz/mafnet/unff-planted-forestry-meeting/conference-papers/exit-of-state-from-plantations.htm, accessed 13 June 2007; and Spence, Nicole, “The Privatization of New Zealand Forests,” Journal of Forestry Research 2 (1997): 203–6; for a discussion of some of the earlier history, see Roche, Michael M., “Reactions to Scarcity: The Management of Forest Resources in Nineteenth-Century Canterbury, New Zealand,” Journal of Forest History (April 1984): 82–91. 15. A domestic model for state-level control of public lands is the 135 million acres of state-trust lands: Souter, Jon and Fairfax, Sally, State Trust Lands: History, Management, and Sustainable Use (Lawrence, Kans., 1996), and Fairfax, Sally, “State Trust Lands Management: A Promising New Application for the Forest Service?” in A Vision for the Forest Service, ed. Sedjo, , 105–41, suggest that these trusts are an “appealing organizational option” to current federal land agencies. 16. For Quincy Library Group, see http://www.qlg.org/pub/contents/chron.htm; for Quivira, see http://quiviracoalition.org/About_Us/index.html; last accessed 14 June 2007; Nie, Martin and Miller, Char, “National Forest Management and Private Land Development: Historical, Political, and Planning Considerations,” Society and Natural Resources (in press); Clary, David A., Timber and the Forest Service (Lawrence, Kans., 1986). 17. Region 7, which covered many eastern states, was eliminated in the 1960s from the Forest Service’s organization structure; The Legal Framework for Cooperative Conservation, Collaborative Governance Report 1 (Missoula: Public Policy Research Institute, University of Montana, 2006), which is an outgrowth of the 2005 White House Conference on Cooperative Conservation, summarizes the federal legislative support for collaborative forestry; Elizabeth Beaver et al., “Seeing the Forest Service for the Trees: A Survey of Proposals for Changing National Forest Policy,” Natural Resources Law Center, University of Colorado School of Law, 25 June 2000, 27–29, http://www.colorado.edu/law/centers/nrlc/publications/Forestry_Reforms_Report.pdf, accessed 14 June 2007. 18. On the Valles Caldera National Preserve, see http://www.vallescaldera.gov/about/, accessed 14 June 2007. 20. Miller, Char, “Crisis Management: Challenge and Controversy in Forest Service History,” Rangelands, June 2005, 14–18. 21. “Q&A: Train, Russell, Green Legislator Pioneer,” American Forests, Autumn 2006, 39. 22. In March 2008, Congress requested that the GAO undertake a study of the feasibility of transferring the Forest Service to the Department of the Interior; Lee, Christopher, “Forest Service May Move to Interior,” Washington Post, 26 March 2008, A3; see also Gorte, Ross W., “Proposals to Merge the Forest Service and the Bureau of Land Management: Issues and Approaches,” Congressional Research Service Report for Congress, 5 May 2008. 23. Information concerning the Durango Public Lands Center can be retrieved at http://www.co.blm.gov/sjra/ and http://www.fs.fed.us/r2/sanjuan/about/organization/servicefirst.pdf, accessed 15 June 2007. 24. Fairfax, Sally K., “When an Agency Outlasts Its Time: A Reflection,” Journal of Forestry (July–August 2005): 265. 25. The 2006 memorandum of understanding is available at http://www.fs.fed.us/servicefirst/, accessed 15 June 2007. 26. A Vision for the Forest Service, ed Sedjo. An earlier version of this essay was originally presented as the Lynn W. Day Distinguished Lecture in Forest and Conservation History, Forest History Society and Duke University, November 9, 2006; and as a keynote address to the late November 2006 conference, “Challenges Facing the U.S. Forest Service: A Critical Review,” co-sponsored by the University of Montana’s Center for the Rocky Mountain West and the Cinnabar Foundation.